TRA Snow & Sun wants you to make a news year’s resolution, not for yourself, but for your residence or business. Solar power provides you with the cleanest form of energy and reduces your carbon footprint, while also saving you money right from the start. So why not resolve to go solar in 2016? With federal tax incentives and state and local rebates, it has never been more affordable to go solar. First, let’s take a look at the solar industry and how it could be affected in 2016, according to data from the Solar Energy Industries Association. The Solar Investment Tax Credit (ITC), a 30 percent federal tax credit on solar energy units for residential and commercial properties, has been extended and remains in effect through Dec. 31, 2016. A tax credit is a dollar-for-dollar reduction on the income taxes that a person or company claiming the credit would otherwise pay the federal government. Since the implementation of the ITC in 2006, the cost to install solar has dropped by more than 73 percent. There are also additional state and local rebates that vary from state to state. Learn more about federal and state solar energy benefits and rebates. Installing solar mounting for your business not only reduces carbon emissions, but it also shows your customers that you are dedicated to preserving the environment and willing to do what’s necessary for that cause. It’s commonly known that buying a home in a good school district or a home with low property taxes will increase the resale value of your property. Now, consider the advantages of having a high quality, energy efficient solar system for your home. Many studies have been done analyzing solar energy systems and residential home values, and most found that homes will sell quicker and for more money. According to a study of California by the U.S. Department of Energy’s (DOE) Lawrence Berkeley National Laboratory, homes with solar power systems sell 20 percent faster and for 17 percent more money compared to homes without. Instead of dumping money into a utility bill, you could be saving money each month with solar energy. In some places around the country, customers are saving well over 100 dollars a month. What about over a long period of time? 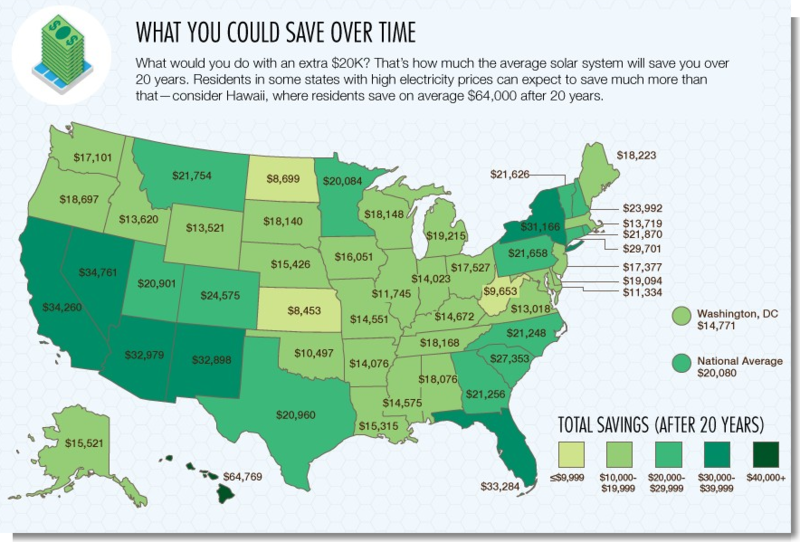 On average, solar users save 20 thousand dollars over 20 years. Raw costs of going solar can be very high, but purchasing power agreements (PPAs), or solar leases, allow a home or business owner to install solar panels for a fixed, monthly rate to use the energy derived from solar. In addition to a fixed rate, a warranty will cover solar energy systems for 20-25 years, and the industry standard guarantees 80 percent performance after 25 years. Even though most energy panels have been around for less than ten years, there’s reason to believe solar panels will be generating a good amount of energy after 30-40 years of use. The benefits of adding solar energy to your home or business are enormous, for your wallet and the environment. There has never been a better time to go solar, so don’t hesitate to contact us for information on solar products and services.